Mica, Talc, Octyldodecanol, Synthetic Fluorphlogopite, Magnesium Stearate, Octyldodecyl Stearoyl Stearate, Phenoxyethanol, Bis-Diglyceryl Polyacyladipate-2, Caprylyl Glycol, Simmondsia Chinensis (Jojoba) Seed Oil, Tocopheryl Acetate. May Contain / Peut Contenir (+/-): Titanium Dioxide (Ci 77891), Iron Oxides/Oxides De Fer (Ci 77491, Ci 77499). Mica, Talc, Octyldodecanol, Magnesium Stearate, Octyldodecyl Stearoyl Stearate, Phenoxyethanol, Bis-Diglyceryl Polyacyladipate-2, Caprylyl Glycol, Simmondsia Chinensis (Jojoba) Seed Oil, Tocopheryl Acetate, Alumina, Triethoxycaprylylsilane. May Contain / Peut Contenir (+/-): Titanium Dioxide (Ci 77891), Iron Oxides/Oxides De Fer (Ci 77491, Ci 77492, Ci 77499). A versatile three-in-one blush and bronzer palette with a highlighter, blush, and bronzer all in one smooth gradient finish. Create a year-round summer glow with the innovative three-in-one Neo-Bronzer. Go from naturally sun-kissed to tropically bronzed with a few swipes. The three “NEO” palettes are a combination of bronzing shades in a smooth, gradient finish. The new shades consist of shimmer and matte formulas in light, medium and deep. The finely milled, light-diffusing pigments enhance and perfect. The bronzer blends smoothly and seamlessly maximizing skin’s radiance with pure warmth, that flatter all complexions. Finely milled pressed powder blends smoothly without fallout. Innovative gradient design features all three hues in one pan. 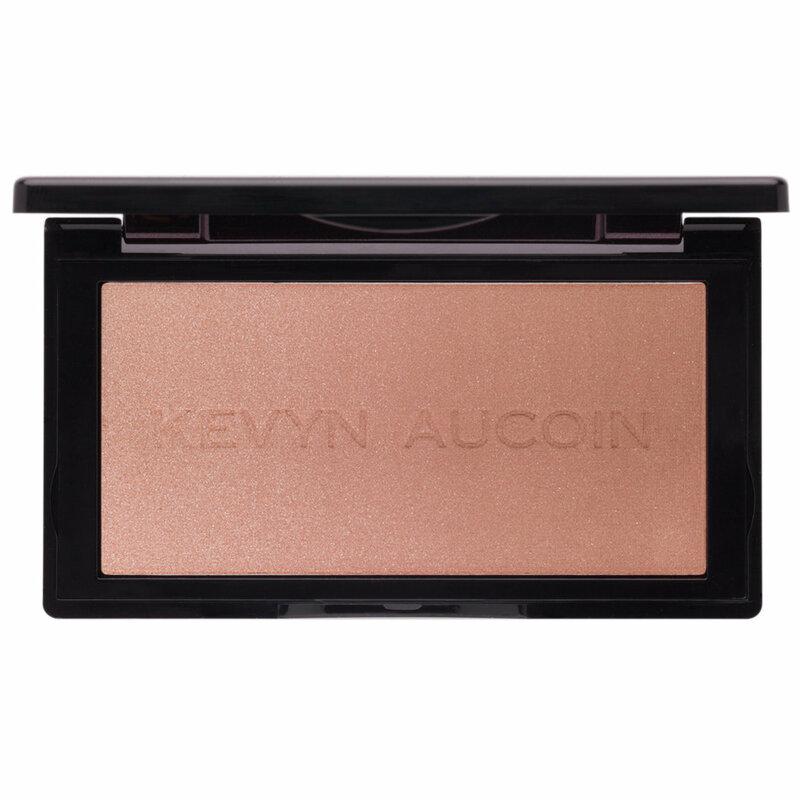 Swipe all three colors from the Kevyn Aucoin Neo Bronzer together with The Large Fan Brush for the illusion of naturally tanned skin. Use them individually to achieve the perfect, custom blended sun-kissed look. This trio from Kevyn Aucoin has been a must-have for me since I used it for the first time. The highlight shade is a gorgeous champagne with hints of pink, the blush is a beautiful medium pink, and the bronzer is on the neutral/cool side so those looking for a cooler bronzer that has zero orange tones will be very pleased! The shades can be swirled together, used separately, or mixed and matched to your heart's content...I am totally in love! The overall finish is glowy, with the highlighter being the most radiant, but no visible glitter...just gorgeous glow. The texture is seriously like velvet and the powders all blend seamlessly without looking dry or emphasizing pores. Wear time is exceptional, I didn't get any fading till around hour 9 and that was because I had bee talking on my cell phone lol! I did find the formula to kick up a bit of powder, but nothing dry or chalky...I am just careful which brushes I use as to prevent waste. All three shades in the compact are very pigmented, so a light hand should be used at first, but they're easy to blend and sheer out if you do go overboard. I was also very surprised and pleased at the size of these compacts...21g of product is quite a lot! Packaging is classic KA, sleek yet substantial, gorgeous yet functional. Out of all of the similarly themed face palettes I've purchased this year, this is by far and away my favorite. My skintone is NW20 and Capri is the perfect mix of shades for me. Just to give an idea of pigmentation, each swatch in my photo is ONE finger swipe! I highly recommend these beautiful KA palettes! I was so disappointed with this bronzer :( I should mention that I have a fair/porcelain complexion, so my experience probably does not apply to many. 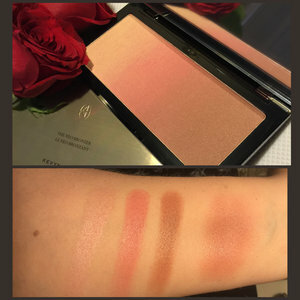 I felt that the product was totally dominated by the blush shade (which is difficult to detect in the pictures but in mine the blush extended through almost the whole thing), so it was very difficult to isolate the bronzer and the highlighter. The highlighter was too dark to show up on my face and the blush was SUPER intense and looked a little crazy on me. When I tried to swipe through the whole thing to pick up all three colors, it still just looked like I put on the blush. This is another amazing product from KA. Finely milled but richly pigmented. It provides the most natural sunkissed look. Lovely for WOC. Love the flexibility in applying it by swirling the product on your brush or using the colors separately with more precision. I use Chikuhodo /Beautylish angled blush brush to apply the product. It's perfect for contouring and blending color. Before applying the bronzer, I mix a little of KAs Celestial Skin Liquid Lighting with my foundation (Make Up Forever Y425) to give my skin a subtle dewy glow. I use Charlottesville Tilbury's Airbrush Flawless Finish micro powder and Tart's marine boosting mist to complete the look. Im not a review writer, even though I rely heavily on reviews when considering a purchase. I just had to write this. I cannot say enough about this product! It's like a 3 in 1. Bronzer blush and highlight or mix! Love it! Such a pretty color and finish. I'm so glad I took the plunge and bought this palette! Blending is a breeze whether you want a sun-kissed cheek or a glam bronzed glow. The combinations are endless which is what makes this purchase such a great value. The finish is super smooth and my skin has never looked better. Highly recommend! The only complaint is that it's a bit too long. It would be great if it was a bit smaller so that my brush could actually hit all colors so I could just do one big swipe across my cheeks for contour, blush & highlight. The colors are beautiful but I hate I have to dip into it several times for coverage instead of just once (which is why I bought in the first place). I'll start out by saying that I didn't have high hopes for this product. The reviews are mixed so I decided to try for myself. This Neo-Bronzer is great! The Siena tone is warm, natural and not over the top bright. I can see why people didn't really care for it though. It takes a bit of trail and error to figure out how best to use it. My method is to view this product is five (5) distinct sections. The darkest I use for a very light contouring and bronzing, I then use the fourth section in my "quad" to define just above the contour area fading up, the center section of my "quad" I use to add the peachy color to the apples of my cheeks. Sections 1 and 2 I use to lightly define the high points of my face. Just look at the photo of this product, there are five visible sections!!! Anyway, once you view it and use it this way, you'll get the hang of it. Beautiful product! Just beautiful! I really love this product as a blush for my skin tone, its super creamy and your finger just glides across it when doing a swatch same with your brush. The pigmentation is everything you would want it to be in a blusher/ bronzer pigmented just enough without too much so being heavy handed will not be to much of a concern. I used my Wayne goss brushes on these and it worked perfectly. The packaging is heavy and sleek with a full size great quality mirror but very travel friendly. I like how you can choose to use one color or sweep it across all of the shades, overall a great purchase for a beauty user and collector. I love this combo product! It goes on like a dream and the color is beautiful. The only down side is there's a lot of fall out. I will buy this again and again. I highly recommend this item. loads to like about this product: lots of product, flattering if applied right, pretty colours. highly recommend a light hand with this and applying in natural or bright light. I applied this in a slightly, warmly lit dim room and I realised I had put on way too much when i went outside. In that lighting, it was invisible on my skin tone. what i don't like is that it seems to have a weird smell.